Peter contacted our site with the following contribution. 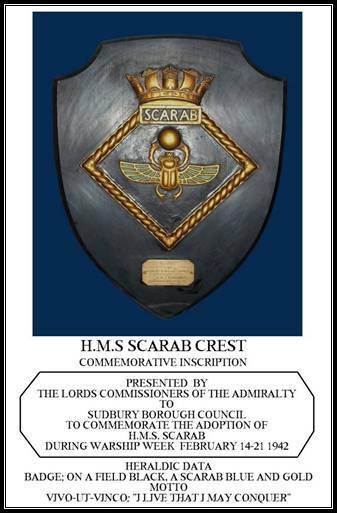 “I have just read the article on Sudbury Warship Week with great interest. His work is well researched, informative and we feel well worth adding to the site. To focus public attention and engender a feeling of direct participation by local communities in the war drive the government sponsored War Savings Movement identified specific areas of activity and requested local authorities to designate one week in each year a ‘War Savings Week’. These nationally led, regionally coordinated and locally organized National Savings campaigns based on service themes enabled the public to respond to the challenge to meet financial targets. These were set by local savings committees and based upon the presumed economic capability of each local community. Although normal savings went on throughout the year they were overshadowed by sporadic weeks when whole communities were encouraged to compete against their neighbours to see who could raise the most money. These big drives were national events. The first successful large drive was War Weapons Weeks held between autumn 1940 and summer 1941. Some towns saved for the cost of vessels but without either vessel names or adoption schemes. In fact War Weapons Weeks were based on Business Men’s Week started 4 March 1918 when the main objective was to raise £100 million within the week. Each location was to contribute the value of a unit of war armament: a dreadnought, cruiser, submarine, aeroplane, tank or howitzer. On 21 August 1941 a new autumn savings campaign was announced. It took the form of Warship Weeks with the intention to realize from the small saver £15 million per week over a twenty-four week period. £360 million. The aggregate Warship Week target figure for England and Wales was quoted as £366.5 million the amount divided between counties. For example Lincolnshire Warship Week’s target was announced in November 1941. The proposed savings would enable the Admiralty to sign contracts for three cruisers at a cost of £3,466,566 plus four destroyers, two submarines and other craft at a cost of £4,007,000. As a commitment before the inauguration of Warship Weeks civic leaders from Lincolnshire’s districts visited Skegness. They delivered signed contracts guaranteeing the cost of 28 warships to Rear Admiral Buckley. The £7,473,566 total was aligned with the Lincolnshire county target of £7 million required by the end of March 1942. Lincolnshire would hold 28 Warship Weeks with 29 adoptions, Skegness Urban District adopting two vessels. The campaign had the support of the Admiralty and combined a popular appeal for increased savings with forging closer links between cities, towns and rural districts and His Majesty’s ships. It was believed that public opinion tended to focus on the highlights of the war at sea and not on the detail, routine and risks of the daily work of the Royal and Merchant Navies. From speaking platforms throughout the land Warship Weeks would thus enable the argument for releasing shipping and other services to be emphasised. The basic message was that the function of the navy was to keep the sea-lanes open to provide the necessities to carry on the war. The public were continually reminded of the vital necessity of replacing ships and vastly increasing naval strength because the sooner the Navy was placed in a supreme position the sooner the war would end and the men return. The scheme was outlined in a letter sent to local savings committees by the president and chairman of the National Savings Committee asking each community to select a week between 18 October 1941 and 28 March 1942. During this period the intention was to raise a sum by investment or deposit in all types of war savings representing the cost of building one of His Majesty’s ships. (Ranging from the smallest to the largest vessels) Local Warship Weeks were part of a county campaign where every district aimed to raise a sum representing the cost of building a vessel during a given week. Arrangements were made with the cooperation of the Admiralty for each area to adopt a ship at a cost equivalent to the target aimed at. To launch the campaign in the county the arrangements were discussed at an early stage. It was important that full civil recognition was given to the campaign and every support to influence, stimulate and inspire the efforts of local savings committees. It was usual for the Admiralty to write to the Lord Lieutenant of the county who then held a conference of MPs, mayors and council chairmen to discuss these Weeks. Only a limited number of vessels of each type were available for adoption and the request for a particular vessel was passed to the Admiralty via Local Savings Committees and Regional Committees. It was the local savings committees who decided when their Warship Weeks would be held and they who selected the vessel type and target figure. Their decision was assisted by looking at previous years’ fund raising particularly War Weapons Weeks and at the financial ability of the community to raise money. (So as not to be over-optimistic) However civic pride and community spirit were factors in preventing target figures being made unduly low. If wages or industry had increased in the area then this could be reason enough to increase the target and either adopt a larger vessel or switch from the purchase price of a hull to a fully fitted vessel. Locality size was an obvious limiting factor hence a small town or rural district would sponsor a motor launch whilst large towns found sufficient money to adopt a cruiser or large destroyer. A city could expect to reach the target required for a battleship or aircraft carrier. Each district which had set itself a target and selected a date for its Warship Week was allocated a vessel by the Admiralty. When the adoption scheme was introduced in order to meet all requests from local authorities it became necessary to include not only completed vessels but those under construction or in the new build programme yet to be laid down. From a total of 1,273 districts 1,178 Warship Weeks were organised by Local Savings Committees. As a further incentive to raise money the Admiralty decreed areas holding Warship Weeks would be provided with the name for the type of ship allocated them - if they previously achieved the sum to the cost of the hull. This would then be communicated in advance of the Warship Week allowing areas to use the name of the vessel in their publicity otherwise the vessel remained a type. Whenever possible a specific attachment to a place was used to develop ties and as a result so many requests to name vessels after cities and towns were received it was impossible to comply with them all. By February 1942 the Admiralty stated that owing to technical considerations it was quite impractical to name ships after a town or area. This was to be accepted as a ruling and no exceptions could be made. However by this time the Admiralty had allocated a number of vessels to towns and areas linked with local names. Many towns had to change vessel type as the admiralty ran out of vessel names, particularly corvettes; a similar priced vessel then being offered. A special feature of Warship Weeks lay in the tangibility of the objective. £10 million pounds was to most minds a distraction, difficult to comprehend. Yet a battleship costing £10 million pounds to build conveyed its own meaning and could be visualized as a concrete reality. The result of work and effort. To provide an idea of build-costs an aircraft carrier price tag was £5.25 million and a cruiser typically £2.75 million. For a large destroyer the major items were broken down into £210,000 for the hull, £250,000 for the main and auxiliary machinery and £240,000 to provide guns and ammunition totalling £700,000. The savings targets therefore were set at either £210,000 for the hull or £700,000 for the fully fitted vessel. At the opposite end of the scale the amount to be raised for the cost of a fully fitted Trawler/Minesweeper was £62,000 including £40,000 for the hull, £19,000 for the main and auxiliary machinery, £1,700 for armament and ammunition and £1,300 for other equipment. In many instances it was anticipated that the objective would be achieved quite early in the week. Local committees were therefore urged to prepare plans for rallying the public to proceed to an additional objective immediately the target was met. The minimum objective for adoption was the cost of the hull. So contributing locations with only hull targets were encouraged to save for the fully fitted vessel once the target was met. Contributions did not end once the target was reached as this was what the government wanted and what the National Savings Committee strove for. Additional savings and investments were all welcomed. Quite often it was announced that a location would save for two vessels. This meant that the target would be doubled but still only one vessel would be adopted. In reality if the target for the vessel was substantially beaten the additional amount was often utilised in paying for additional vessels. The Admiralty further provided lists of standard naval items for savings committees to be used by savings groups in selecting targets. Typical targets for Warship Weeks are shown in the table below. Groups could save for single, additional or multiple items and often groups combined to achieve common targets. The groups were organized voluntarily and when wanting to increase or alter their targets they had to be agreed upon by all members. One group normally contributing £3 per week set a target during Richmond’s Warship Week of £40 for a Carley life float. This target was soon passed so was changed to a large life float costing £60 which was achieved with £7 13s to spare. Additional money raised through other efforts such as concerts for purchasing naval items was passed to the Admiralty. Scotland’s Warship Weeks were to be held throughout the same twenty-four weeks as in England and Wales yet as early as 27 October 1941 it was reported in view of Stirlingshire having already raised £1.5 million for War Weapons Week and as large sums had left the county to Glasgow Warship Week the local committee would delay fixing a week until it ascertained whether a week in April or May 1942 was acceptable to headquarters. In January 1942 the Chairman of the Scottish Savings Committee informed the Lord Lieutenant of Stirlingshire the Chancellor was willing to authorize an extension in Scotland until the end of May for the time allotted for holding Warship Weeks. Nonetheless where an extension was sanctioned it had to be through exceptional local conditions that justified relaxation. Meanwhile the Chancellor stressed the urgency of pressing forward Warship Weeks concluding them wherever possible by the end of March 1942. In actuality a high percentage of Scotland’s Warship Weeks were held throughout April and May 1942. Ulster would also adopt a small number of vessels. In Scotland the tendency was for a county to adopt a single vessel with the exceptions of cities and major towns which adopted their own vessels. A county was divided into districts and divisions each provided with a quota objective. The County of Argyll for example was contested between Kintyre and Campbeltown and Cowal and Dunoon the remaining districts making up the smaller figures. The aim was to raise £300,000 to adopt a destroyer. 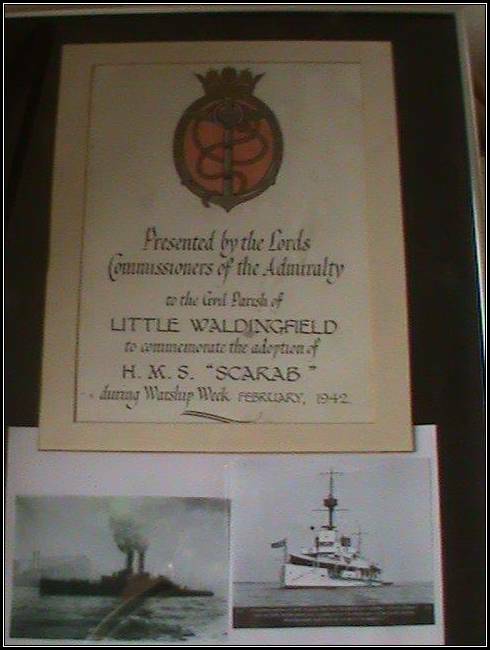 During 14th - 21st February 1942 Little Waldingfield, along with Sudbury and the village of Long Melford, took part in Warship Week. By the end of Warship Week Little Waldingfield had raised a total of £1,644 and sixpence (nearly £65,500 today). As part of this campaign the village, as part of a District, adopted the Insect Class River Gunboat HMS Scarab. 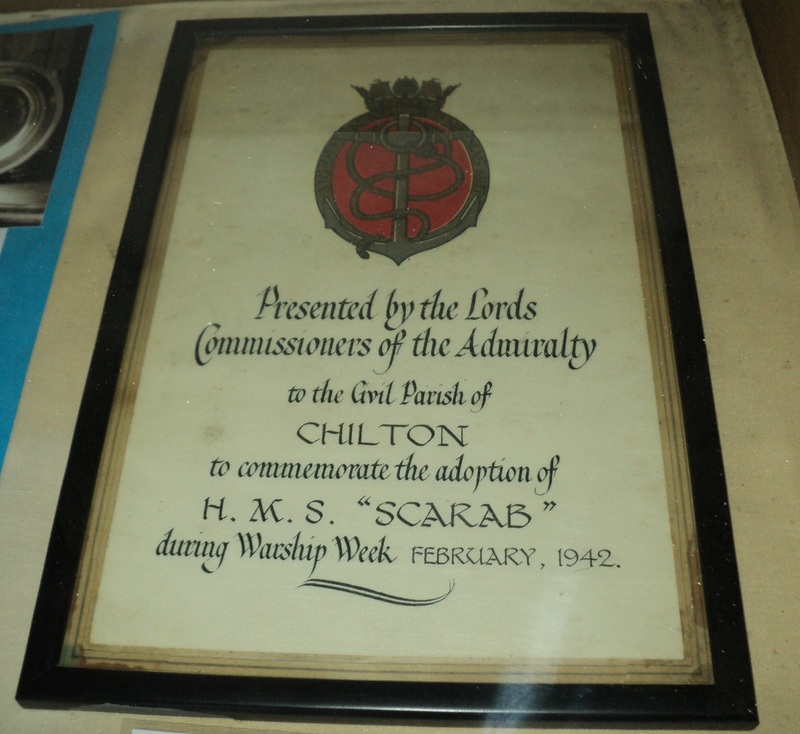 A scroll can be seen in the village Parish Room (above) which confirms this affiliation. 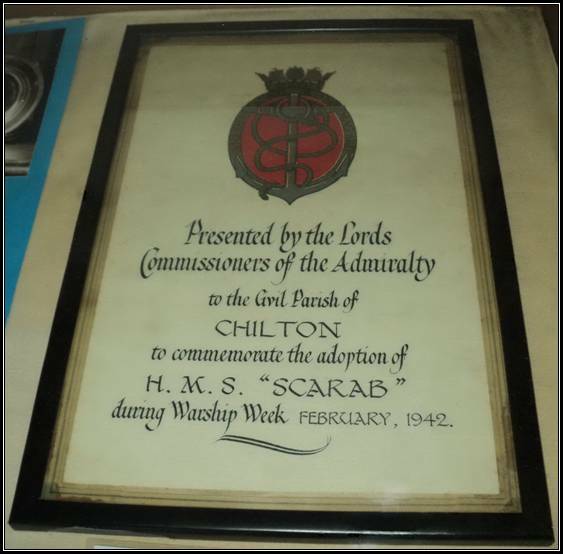 To commemorate the association with the vessel the Admiralty presented adoption plaques for permanent exhibition in the Town Hall or Council Offices, while the parishes received illuminated certificates. 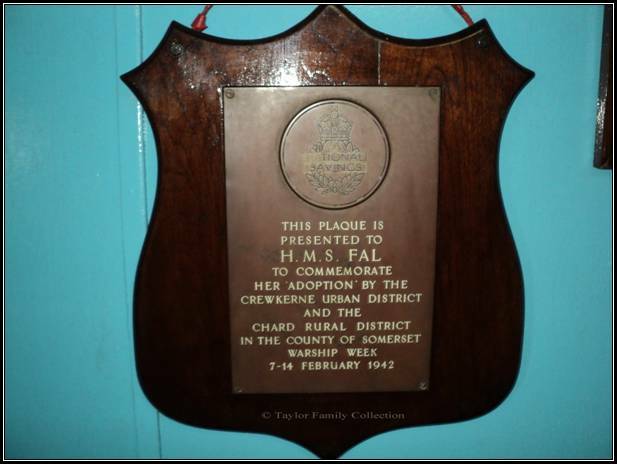 Two types of plaques could be presented. 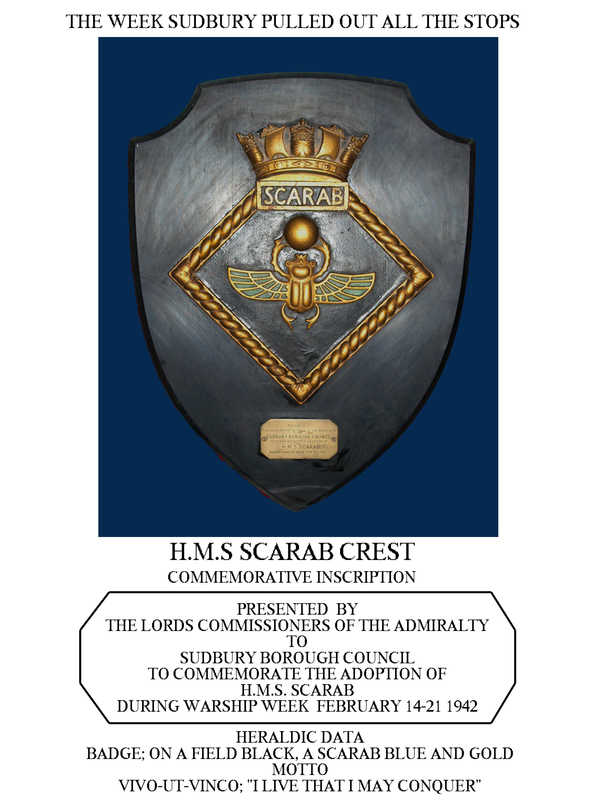 The first a replica Ship’s Crest for vessels with official crests and the second a standard Admiralty Shield for vessels without official crests. Only vessels down to the size of sloops were allocated ship’s crests. The adopting area itself provided a suitable plaque for display onboard the adopted vessel. Unfortunately there were war losses but this did not stop communities adopting like vessels as replacements (additional fund-raising through National Savings collected over an extended period) and the links with the new vessel continued thereafter. Once hostilities ended and vessels were decommissioned the Lords Commissioners of the Admiralty informed communities the association between adopters and vessels would conclude. 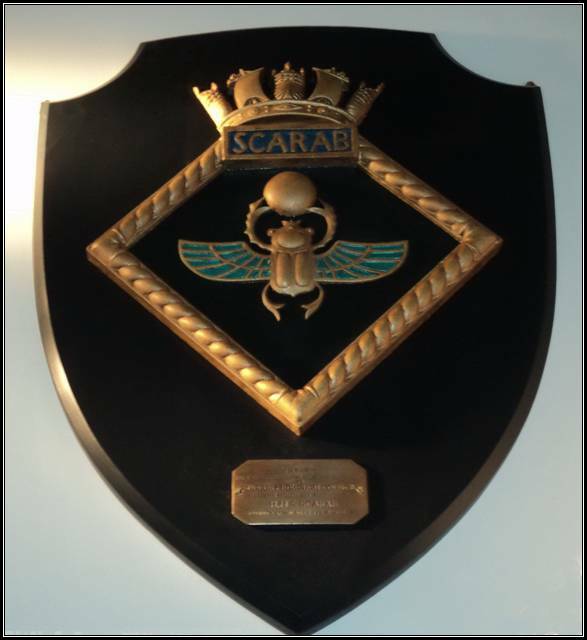 Warship adoption did not end there as coincidental with Warship Weeks was an expansion of sea cadets and the formation of new units or Training Ships (TS), local units taking their names after a town’s adopted vessel. As time has passed and adoption plaques are rediscovered the myth that a vessel was paid for by the local population has transpired. In truth this was never the case as institutional concerns raised the majority of the target by investing in War and Defence Bonds, the small investor and saver contributing their reduced contributions in savings stamps, certificates, 3% Defence Bonds and deposits in the Trustee and Post Office Savings Banks. Money realised for adoptions were thus investments and savings lent to the War Treasury generally redeemable at a date after the war. To provide some idea of the influence of large investors Dundee Warship Week with a target of £2.5 million was guaranteed success as even before the Week opened £2.4 million had been promised. The organisers increased their target to £3.5 million to provide another vessel and announced it would be fitting if the small investor contributed the additional £750,000. In fact on the opening day £1,643,097 was deposited of which £1,615,340 was contributed through joint stock banks; the final total reached £3.75 million. During the twenty-four weeks of the Warship Week campaign an accumulative total of £955,611,589 flowed in as loans to the Exchequer including £545,640,770 realised in Warship Weeks themselves. The national savings campaign was a constant effort to ensure a steady flow of regular contributions to the national chest as war costs increased. As the budget deficit expanded it was always a game of catch up. Effort increased year-on-year putting more life into the campaign at more cost while results from real savings are difficult to define. For large investors the swelling of figures by the exchange of idle bank deposits or free company reserves did nothing to assist the war effort or reduce the risk of inflation. This was a view the Treasury later came round to. It is arguable that the final figures realized through the National Savings Committee give no clues to the aggregate of new savings coming from all classes of the community and consisting to a large extent of transfers from previous savings. The officials consoled themselves in the belief little harm was done and some good came out of it all. Moreover in the later phases of the campaign these Weeks had their uses in sustaining morale when judged in a wider context. More than the simple stimulation of saving which was their main purpose.